Our Summer byDESIGN Newsletter is here! With the first half of 2015 already behind us, it’s safe to say that things are picking up. We’re delighted to share some of our latest projects with you in this edition of our newsletter from our urban planning, architectural design, and landscape architecture studios. 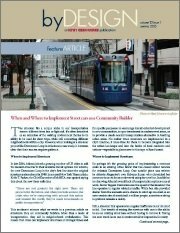 How can streetcars fit into our transportation systems and act as community builders? Also, in the news section you’ll be able to read about our growing team’s involvement in the community through organizations like the Congress for the New Urbanism and the Urban Land Institute. We hope you have a great summer and we’ll be back this Winter with some exciting company news.